Fuel Rewards Network (FRN) currently offer a promotion. 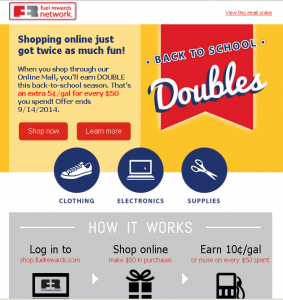 You can earn extra 5¢/gal discount for every $50 purchase made through FRN shopping portal. The promotion ends on Sep 14th. The portal regularly offers 5¢/gal for every $50 purchase, and now it’s double! 10¢/gal. Please note that the rewards won’t double on bonus reward. 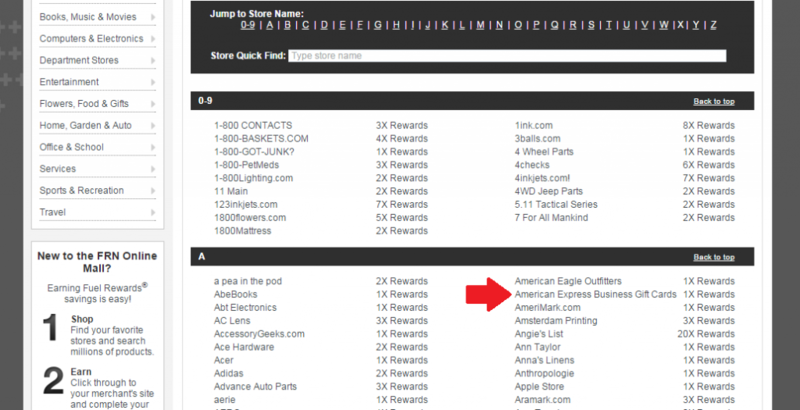 Some retailers originally offer 2x, 3x… reward, but you can’t earn 4x, 6x…. on this promotion. It is just that you can earn EXTRA 5¢/gal for every $50 purchase. Deal is back now! If you buy a $500 American Express gift card, you earn $1/gal discount. In July, reward on AmEx GC purchases went down from 2x to 1x (10¢ to 5¢/gal). The same thing happened to all other shopping portals. As of Aug 13th, best portal and rate for AmEx GC is 2.7% cash back at Befrugal.com. FRN reward is redeemable up to 20 gallons. So, during this promotion, FRN reward for AmEx GC is equivalent to 4% cashback. It is currently the best rate of all portals. After July, most portals stop paying cash back for AmEx GC purchase if you use any promo code. There is always a promo code available to waive $3.95 purchase fee. But if you use the code, there is no reward or cash back at all. I bought four AmEx GCs in July and used the promo code on every purchase. Several pending cash back appeared in my account of a portal site, but soon they got all cancelled. (click here to see details) So, never use any code otherwise you got no reward. I purchased $2000 AmEx GC through FRN today, and it will give me $4/gal discount. From my experience, the reward will be posted and available in approximately 30 days. It’s too bad that I can’t confirm the reward during the promotion, but as long as you read the terms and conditions, and do nothing against them, and you will earn a reward. 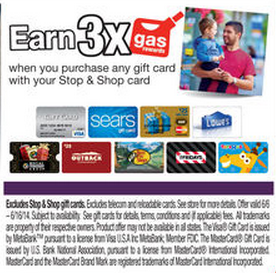 6/6/2014 thru 6/16/2014, you can earn 3x gas rewards when you purchase any gift card at Stop & Shop. I was lucky enough the store has $20-$500 Visa gift cards. I knew the store had lots of gift cards including Visa, MasterCard, or American Express, but I have never seen $20-$500 gift cards. There is a bunch of them now. It seems the store have just restocked them. Without thinking, I picked up and took it to the cashier. I had it loaded $500, and a fee is just $5.95. That is only 1.19%. I used American Express Blue Cash Preferred so I will get 6% cash back ($30.36) in addition to 3x gas rewards (1500 pts = $1.50/gal). I don’t know full potential of Visa GC, but at least I know that you can load American Express Serve at Walmart and withdraw money to your bank account. There is no fee in this process. It is just you need a trip to Walmart, and it takes up to 5 days to withdraw money to your bank account. On the other day, I tried to get cash back with Visa GC (issued by the same bank, MetaBank) at the register of Target, but it couldn’t succeed. A PIN pad said, “Access denied, contact issuer”. At that time, I used $100 Visa GC (issued by the same bank, MetaBank), and tried to get $40 cash back. What if I choose a smaller amount of cash back? What about other stores. I will have to find out. 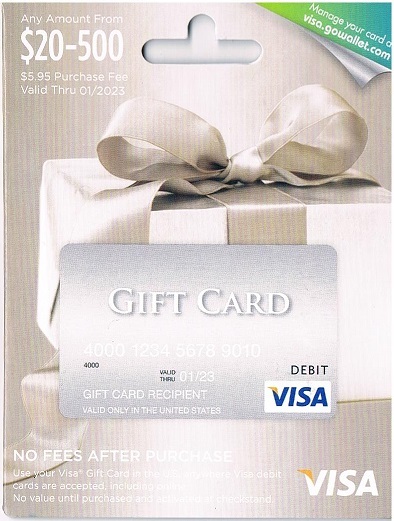 Of course, you can use the gift card normally, at grocery stores, gas stations, online purchases, etc. After you add the GC to your PayPal account, you can spend it on eBay purchases, too. If I buy an amazon gift card with the Visa GC, there is no credit card cash back. However, since there is no purchase fee on amazon gift cards, you can buy $500 amazon gift card with $500 Visa gift card. And I will get another 1500 pts! This is just one example, but starting with $500 Visa GC, you will be able to choose a lot of options and earn a lot of gas rewards as well! Although both programs let you redeem the reward at Shell gas stations, the reward’s points can’t be combined or redeemed together. Let’s see what is the difference between these two programs. Both programs are great. I found it very easy to earn S&S reward. But there is only one problem with this program. That is “It has a limit, $2.20 per gallon Max per transaction.” Even if you have lots of points, you can’t redeem more than 2200 point. For FRN, you can lower the price to almost $0/gal. Even if you use the most effective way to earn FRN rewards that fits your regular spending, it is probably not enough to make the price down to $0.01/gal. In the FRN website, you can see at least five FRN members paid $0.01/gal every day. If you want to become one of those, you’ll have to work at it. 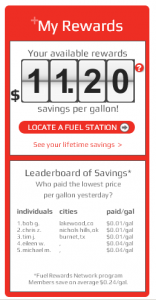 If you are interested in $0.01/gal, read blog “Ultimate Strategy of Fuel Rewards Network 1/2“. 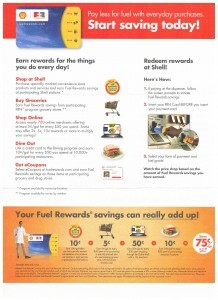 I believe the best way to save gas money is use Fuel Rewards Network (FRN). 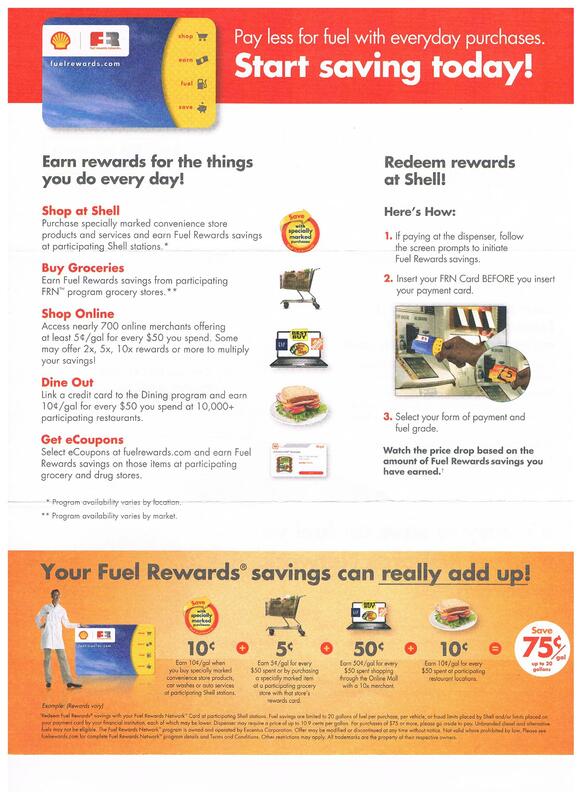 FRN is a reward program for Shell gas station. It is free to join. Sign up and request a membership card. You will need the card to redeem rewards, but you don’t need it to earn the rewards. Start earning today! There are two reasons this program is so great. One is there are many ways to earn the rewards, and the other is you can redeem as much reward as a price of gas. (it’s possible to pay only $0.01/gal.) Here are all the ways to earn FRN reward. When I became a member and found the Online Mall in FRN, I got excited. 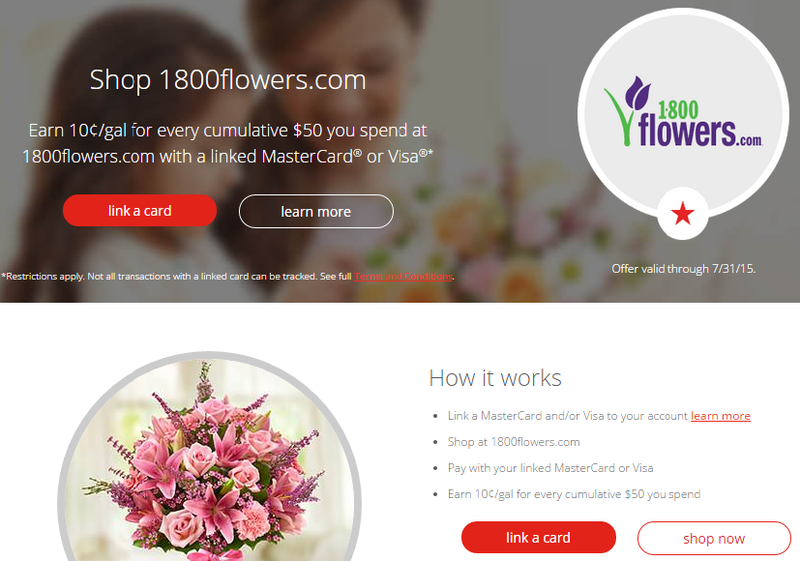 The Online Mall is similar to credit cards’ such as ShopDiscover and Ultimate Rewards. I’m receiving lots of Cash Back from them on online purchases. I thought it was good opportunity to add another type of Online Mall for gas money. However, soon after I compared FRN Online Mall with ShopDiscover, I got disappointed. Because ShopDiscover’s reward would be better than FRN for all online retailers I usually shop. I might as well forget about FRN and keep using ShopDiscover. You now have $500 gift card which can be used anywhere it accepts American Express. You may buy groceries at a supermarket or wholesale items at Costco. But, let’s get more reward out of this gift card. Go back to FRN Online Mall and buy store’s gift cards with AmEx gift card and then make a purchase with store’s gift cards. 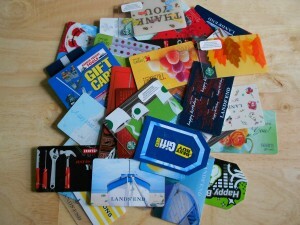 As long as online store accepts AmEx, you can buy stores gift cards with AmEx gift card. It depends on stores that a purchase of gift cards or a purchase with store’s gift card is eligible for FRN reward. If both transactions are eligible for the reward, you will get another 5¢x$500/$50+5¢x$500/$50=$1/gal discount. (If the store gives bonus, $1/gal will be multiplied.) Great! you will have to spend $500 anyway, but you will get at least $2/gal discount. This is a strategy for those who already have a plan to buy something online. You earn the reward on the purchase of AmEx gift card, and turn AmEx gift card into store’s gift cards, but you will have to make a final purchase at the stores with store’s gift cards. What I do (as an eBay and amazon seller) is buy items with store’s gift cards, and then sell items on eBay and amazon. I set the prices by adding only selling fee and shipping cost to the price I paid to the stores. I don’t make a profit from the sales, but the reward stays! For some items, I buy only on sale. For some items, use coupons, that helps me compete with other sellers. And not only FRN reward, but I also earn the reward of store’s loyalty programs, which will be also your profit! 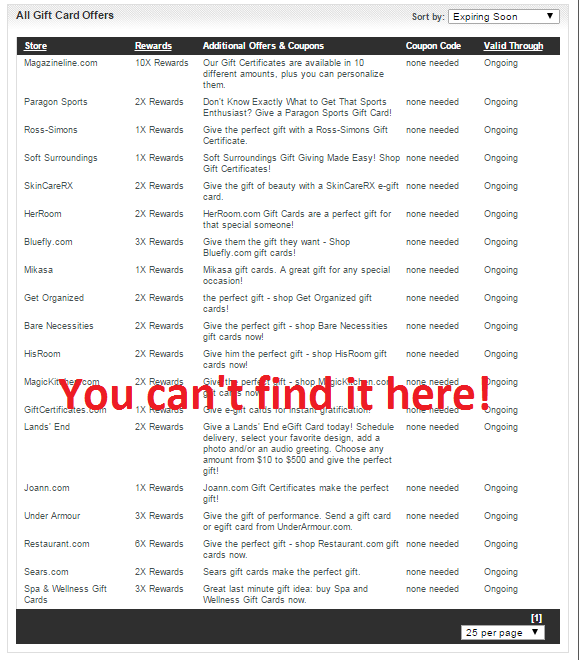 Note you need to avoid using Discover cards to purchase AmEx gift cards. Discover treats the transactions as Cash Advance and charges a fee. As long as I know, Chase and Amex cards are safe to use for the purchase of Amex gift cards. Both cents-per-gallon discounts are eligible for up to 20 gallons with one fill-up. “one fill-up” means that even if you redeem the reward and purchase less than 20 gallons, the discount won’t carry over for the next fill-up. To earn BP’s 5¢/gal discount, you have to make 2 transactions that total at least 20 gallons. To maximize the reward, use a sign up bonus (10¢/gal discount) and purchase 20 gallons at the first pump. Then make another transaction, but this time pump as little as possible. This meets requirements for the reward, and you will be able to use for next purchase of 20 gallons. By keeping this cycle, you will receive almost 5¢ discount on average. However, this way works for vehicles that have big fuel tanks. If you have a small vehicle that has 10-gallon fuel tank, you will receive only 2.5¢ discount on average. Fuel Rewards Network (FRN) is no requirement to get a discount. All you need to do is insert the FRN card before pumping at Shell. Because BP Driver Rewards needs 2 transactions to earn the reward, if you have a SUV or truck which have larger than 20-gallon fuel tank, you can constantly receive (almost) 5¢/gal discount in the way described above. But, if it’s 12-gallon tank, you can earn 3¢/gal discount on average. So, if a capacity of fuel tank of your car is more than 12 gallons, BP Driver Rewards gives you better rewards on average. If it’s less than 12 gallons, use FRN and you will earn 3¢/gal discount every fill-up. This is only a comparison of rewards you can earn through gas purchases. While BP Driver Rewards doesn’t have any other strategy to maximize the reward, FRN has various ways to earn more and more rewards. I will explain this later. Before that, I’d like to introduce two other reward programs in the next post, “Shop Your Way GAS REWARDS vs Stop & Shop Gas Rewards“.